The stunnig sun deck of the V2V Empress. Royal Class seating aboard the VSV vessels. For travellers seeking a highly personalised and truly authentic experience, V2V Vacations promises to provide a uniquely beautiful, comfortable and convenient journey between downtown Vancouver and downtown Victoria in British Columbia, Canada. 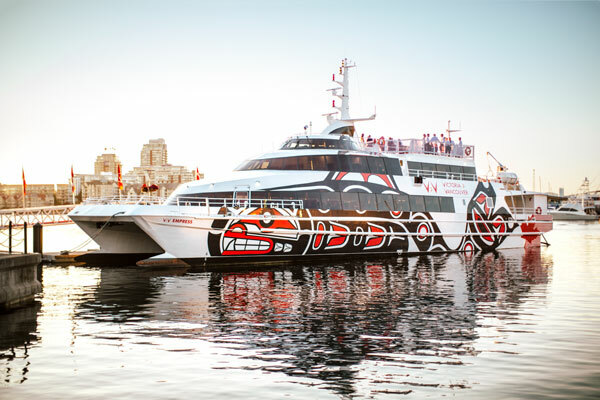 The waters of southwestern British Columbia, Canada, are some of the most spectacular in the world, and it’s wonderfully easy to experience it all aboard the stylish 242-passenger high-speed catamaran V2V Empress. Sailing directly from downtown Vancouver across the Salish Sea and meandering through the magnificent British Columbia Gulf Islands into Victoria’s Inner Harbour on Vancouver Island, passengers frequently spot wildlife such as orcas, bald eagles or sea lions. Throughout the 3.5-hour journey, you also have the chance to taste local flavours; the onboard menu features foods and non-alcoholic as well as alcoholic beverages exclusively sourced from the region. The stunning sun deck of the V2V Empress. In Vancouver, the V2V Empress terminal is located downtown by the convention centre, within short walking distance of the Vancouver Cruise Terminal, and a wide range of accommodation options as well as boutique properties. In Victoria, the ship arrives and departs directly from the Inner Harbour across from the British Columbia Provincial Legislature. The V2V dock is an easy four-minute walk from the Fairmont Empress Hotel as well as all pick-up points to the best Victoria and Butchart Gardens sightseeing tours and activities, which means no lengthy and cumbersome transfers by bus or cab to and from ferry terminals. If you choose to cruise with the V2V Empress to Victoria for the day, you’ll have enough time to wander the gorgeous downtown area, with its British colonial architecture just made for you to shop, sightsee, admire heritage buildings, visit the fabulous Butchart Gardens, or relish some afternoon high tea at the Fairmont Empress Hotel. For those looking for a more active, adventurous day, there are plenty of places to rent bicycles and explore the city’s many paths and trails, or grab a kayak – another great way to see Victoria and more local marine wildlife from a unique vantage point. 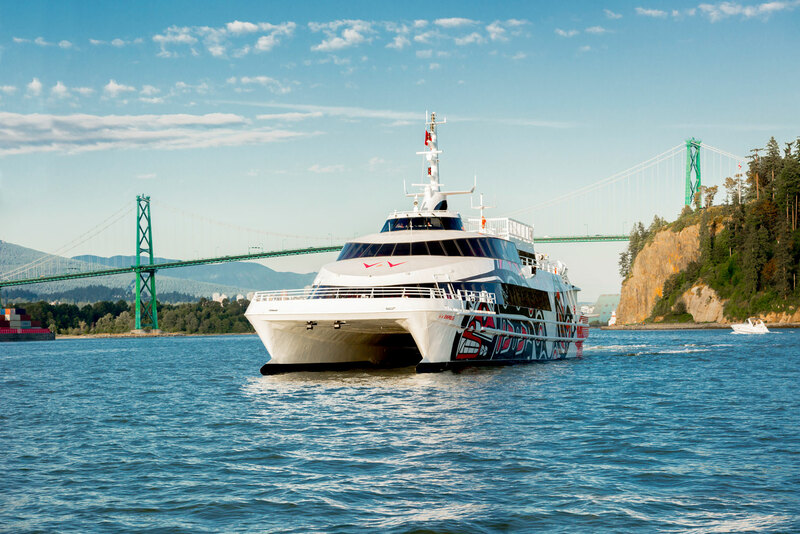 After a big day exploring the historic capital of British Columbia, it’s so great to be able to relax in your comfortable, reserved seat back aboard V2V Empress, sip on glass of British Columbia wine, and let the crew sail you back in style directly to downtown Vancouver. V2V offers two classes of service, Premium class and Royal class. 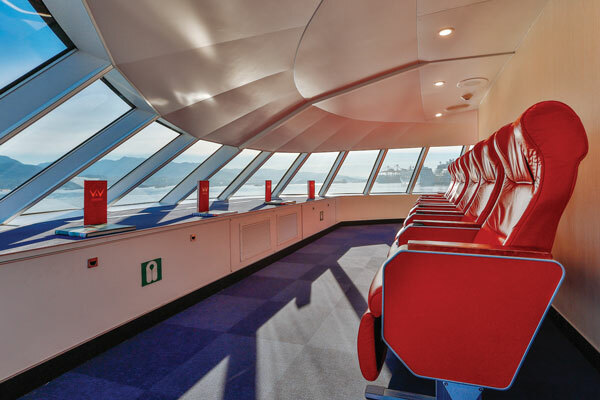 Both classes feature comfortable ergonomic leather seats equipped with individual international power outlets, and there is free wi-fi throughout the ship. All seating is reserved, so when you go up to the sundeck to enjoy the incredible 360-degree views as you sail past Stanley Park in Vancouver, through the British Columbia Gulf Islands and into the Inner Harbor of Victoria, you can rest assure that your seat won’t be occupied by someone else once you come back inside. Royal class is tailored to those that appreciate a more intimate space and highly personalised service. Located on the upper deck, Royal guests can enjoy the best views and attentive service with food and drinks served directly to their seat. A welcome drink and a three-course light meal in both directions is included in the fare, as well as unlimited non-alcoholic beverages such as coffee (including espresso), tea and soft drinks. If you travel with family or friends, Premium class is located on the accessible main deck and is a great choice. It offers comfortable ergonomically designed seats and family-style seating with handcrafted wooden tables. Local food, snacks and beverages are available to buy. No matter which class you choose for the journey, a trip on V2V Empress makes for an amazing add-on to your Alaska cruise or your Rocky Mountaineer train journey, or just a fantastic and truly memorable daytrip or weekender discovering Victoria and Vancouver Island for a day or more. The trip showcases this stunning corner of the world with service, comfort and luxury.